Comment: I would like to get an estimate for repairing some cracked brick. The wall moves slightly when pressed on and may need additional work there. Comment: I have a small section of sculptured concrete, approximately 60 square feet, that is flaking and cracking. It is at the intersection of my driveway and the sidewalk in front of my house. It needs to be either replaced or repaired. I am willing to consider either bricks or sculptured concrete to meet our community standards. Comment: House sill required some replacement 6-8'. Brick foundation and a few course removed to facilitate sill replacement. Need approx 105 scratched red brick mortared in place. Comment: On the back side of my house the brick has cracked and when pushed on the wall moves slightly. Comment: I am buying a house and need estimates on the cost to fix the place (specifically repointing / sealing the brick). This is a 170 year old house and it looks like it was partially re-pointed at some time. But other sections of the house are not repaired. And there is tons of leaking coming through around the chimneys and it also seems to be coming through at the corners and walls. So I need quotes on the cost to fix so I can get a deduction on the purchase price (I can pay for your time) and then I will need to get it fixed after I but the house. 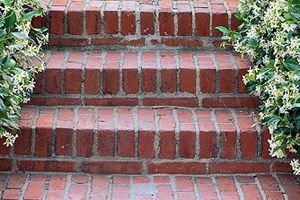 Comment: I am looking for an individual or a company to replace the wood steps with brick. Charleston Brick & Stone Masonry Contractors are rated 4.72 out of 5 based on 115 reviews of 3 pros. Not Looking for Brick & Stone Contractors in Charleston, SC?